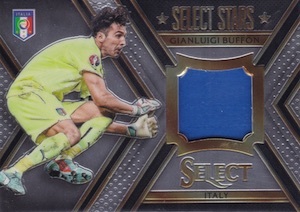 Continuing a recent push by Panini into the higher end of international soccer cards, 2015 Panini Select Soccer incorporates some of the biggest global stars into the familiar Select brand. Each hobby box promises three total hits and eight Prizm parallels. Featuring Prizm technology, the shiny cards showcase a bold look and plenty of color. 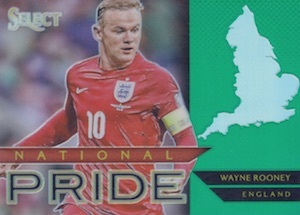 Base cards highlight players from some of the top national teams in the world, including Germany, Brazil, Spain, Portugal and England. Collectors can also find Base Variations with a different image at a rate of one per box. Likely to command the most attention, several autographed inserts are available in 2015 Panini Select Soccer. Select Signatures feature a sticker autograph and tentative names like Lionel Messi, Cristiano Ronaldo, Neymar, Yaya Toure, James Rodriguez and Andres Iniesta. Select Combo Signatures double the effort with pairings such as Cristano Ronaldo - Pepe, Andres Iniesta - Sergio Ramos, Mats Hummels - Mesut Ozil and Philipp Lahm - Per Mertesacker. Looking back at former greats like Franz Beckenbauer, Roberto Baggio, Michael Ballack, Alan Shearer, Oliver Kahn and Christian Vieri, Historic Signatures feature a horizontal orientation. While the specific insert was not mentioned, new signers include Bastian Schweinsteiger, Juan Mata, Harry Kane, Ivan Rakitic and Santi Cazorla. 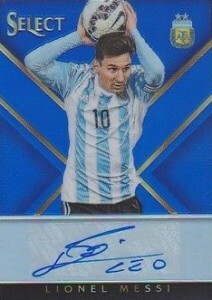 A first for Panini in their soccer lineup, Jersey Autographs include a piece of event-worn jersey with a signature. Numbered to 299 or less, six parallels add to that, including Prime Gold (#/10), Prime Green (#/5) and Prime Black (1/1). Offering more on the relic side of things, Double Team Memorabilia pair notable teammates with event-worn swatches. Finally, inserts drop four per box (1:3 packs) in total. Among the options, Equalizers covers the top scorers. National Pride honors those with the most caps. Dynamic Duos is a combo card for teammates. Featuring a fantasy mindset, Ultimate Team offers a dream starting 11. Most of the base and inserts can also be found with seven Prizm parallels. This includes Blue (#/299 or less), Red (#/199 or less), Purple (#/99 or less), Tie Dye (#/30 or less), Gold (#/10 or less), Green (#/5 or less) and Black (1/1). Every 5-card pack of 2015 Panini Select Soccer includes either an autograph, memorabilia card, numbered Prizm parallel or SP Photo Variation. Great product & content !!! Jan Do, how many box’s have you opened ?? Just wondering how you based your take on the product . Thanks DJ. 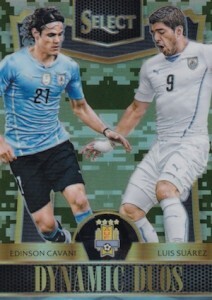 not a soccer fan but loving these cards.. This is a good product, but I’m sort of agreeing with Jan Do, the goalkeepers wear different color jerseys than the rest of the team, other than that its good. Great product, great design – love these cards! Lots of great autos to chase, and the prizm variations just add to the fun. Even though I didn’t have any jaw-dropping ‘colossal’ hits in my boxes, I plan to buy more. Simply because this was the most fun I’ve had with any product in the 2015/16 season. Great product, the cards are beautiful. I have to disagree with Jan Do, if you look up some pictures of Cellissen in his national jersey you can clearly see the orange in his jersey (shoulders). 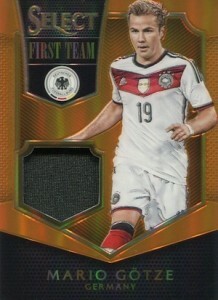 I don’t think Panini could afford to make cards with fake patches. dear red devil, so you are saying that they only used cillesen shoulder patches for this product ? 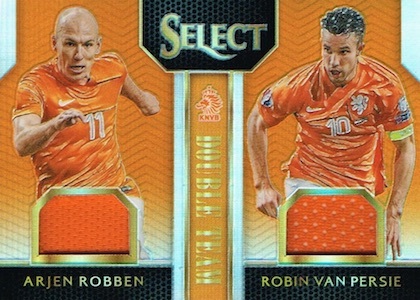 I was wrong about the national jersey though, his Ajax jersey does have orange sleeves and shoulders. 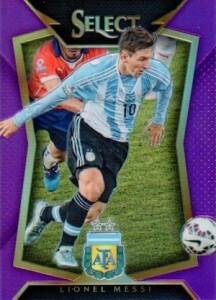 The base variant cards have a football on the top left on the back of the card. Guys this is a great product. All Hits are numbered 199 or less and u get a lot for what u are paying, the cillissen jersey can be from the Ajax one also note that many of these jerseys are event used and they may not even be wearing a jersey with their name on it; a plain one could be possible. It says player worn for many and not game used so there’s no point in whether its club or national team jersey.